It's always fun and inspirational to check out other classrooms. In this post, I'll be sharing my space as well as decor ideas and resources you might like. One of my favorite spaces is my class library. I love having a little nook where students can relax and read. I have two animal print beanbag chairs, a bunch of coordinating throw pillows, and a rug so the kids are comfortable. I used a storage closet to block off the space, and the kids were pretty pleased with it. 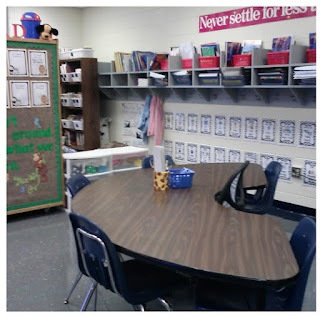 Another space where organization is important is the around the guided reading table. You can not see it, but I took a metal oil pan, painted it, and used it as my focus wall. It is behind my seat. I post my anchor charts on it as well as our objectives for the period and any other teaching tools I use. I also keep my kids materials in color coded baskets as well as highlighters, sticky notes, organizers, and interactive notebooks within arms' reach for quick transitions. 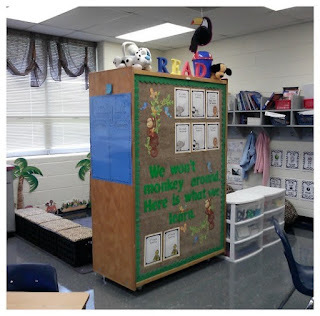 All summer, I worked on little projects to give the room a personal touch in order to make my students feel special. I made curtains for the windows, crate seats for my reading nook, a cool stool for Author of the Day, and recovered a mailbox with decoupage (animal print of course). I also have printed and displayed quite a few things I've listed on Teachers Pay Teachers. 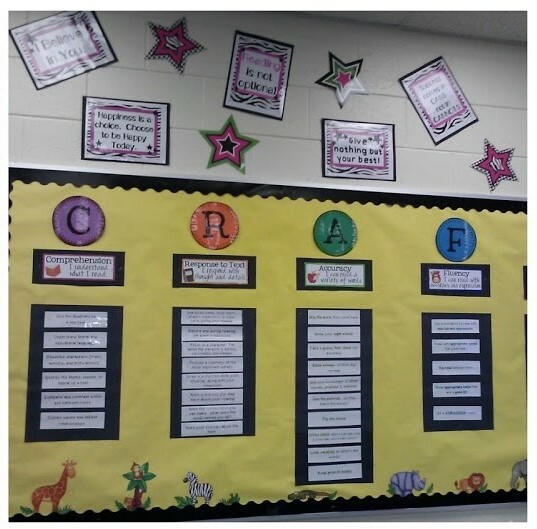 In the photo above, my phoneme posters are on display for use with word study instruction. My kids refer to them especially with writing when they're unsure of a pattern. These are the black chevron patterned set, but I created 5-6 versions to coordinate with various color schemes. You can find them all in the word study category in my shop. Several items I used were free animal print resources done by others. 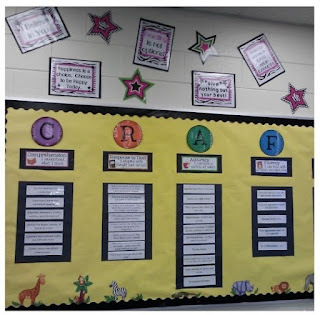 I used the Craft Board from Ladybug Teaching Files and Safari themed frames from another seller on Teachers Pay Teachers that I will display our homework assignments on. I would link them, but they are no longer available. I do think it would be easy enough to recreate though. 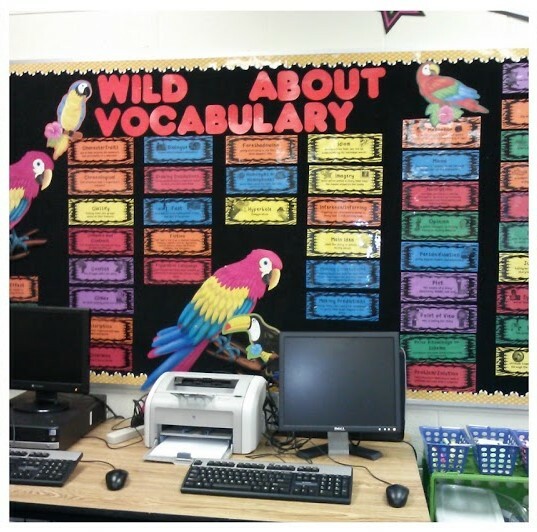 The bulletin board to the left is my "testing" vocabulary wall. 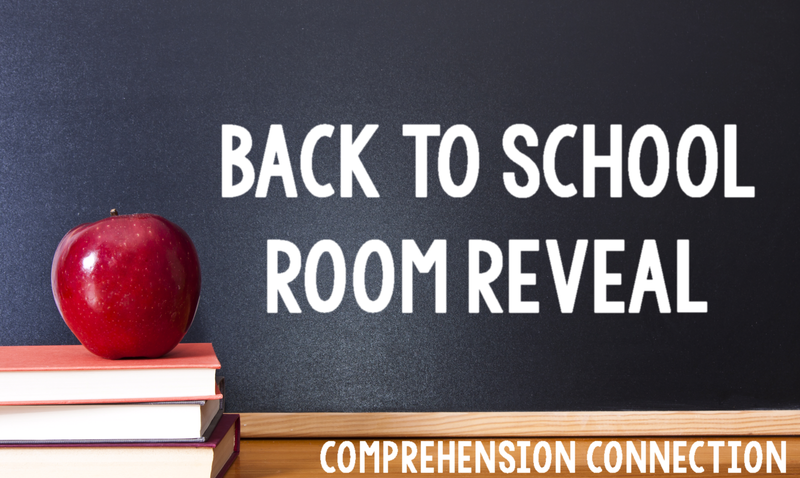 I refer to it often and review the words so that my kids recognize them and KNOW them. 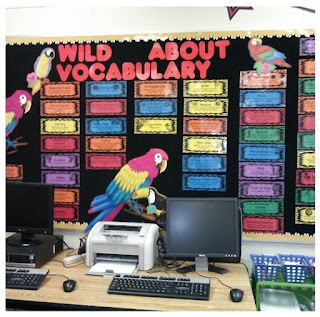 Half of the challenge with testing is not getting hung up on vocabulary. Here is the link to the resource in my shop. At the front of my room, I have my Smartboard for whole group modeling. In the foreground, I have a second guided reading table for the time when I have a teaching assistant in the room. She tutors and runs some small group intervention with me. 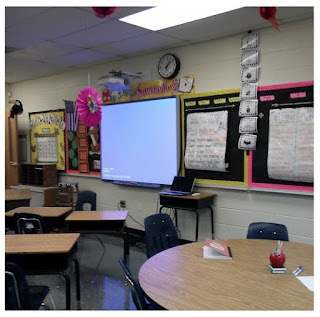 To the right of my Smartboard, I display anchor charts we're using on magnetized curtain rods I found at Walmart. I used the clip rings to hang them. They hold 3-4 posters max, but they are handy. Well, my room is done, but my lesson plans are not. Enjoy the day off everyone. I've put things off for a bit, so it's time to get busy! Thanks Bethany! It was fun finding cute things on Pinterest to copy. One thing I forgot to mention was the magnetized curtain rods I found at Walmart for my anchor charts. That's worked out great! I also should have taken a picture of my reading nook. I put labels on my book baskets with Mod Podge...another idea I borrowed from Christina Bainbridge. How exciting to have a full size room! I don't have a chance until they build a new school. We're bursting at the seams! It is really nice having room to spread apart. I was in a super small room last year, so appreciate it this year. It won't be forever I know. Thanks for stopping by, Melissa. I follow your blog too. Your room looks great! I love your reading nook. Thanks for the compliment...I love it too. I have enough room back there to have a cozy reading group time for read alouds, and the kids actually ask to come in during the recess time...already! That was my hope.